The GrandPrix redefines possibility from a tw—without breaking the bank. Specifically engineered with the home user and space-constrained shop mechanic in mind, the GrandPrix is equipped with Bi-metric™ arms suited for both symmetric and asymmetric handling of vehicles. That means if you want more door-opening clearance with cars positioned farther to the rear, the Bi-metric arms can accommodate your needs. Or, if you’re more of a “center-is-better” type, the purposefully designed dual-positioning arm configuration can handle that too. Specifically equipped with telescoping low-profile arms, all three GrandPrix models are ready to tackle low ground-clearance vehicles such as race cars and modified imports. Of course, with a robust 7,000-lb. lifting capacity, light-duty trucks and SUVs are no problem at all. Unfortunately, the car lift world is full of cheap, knock-off lifts with little or no engineering documentation to back up the many vague safety claims that are out there. That’s why the Grand Prix offers full ALI Certification: so you get total peace of mind. In addition to being safer than other lifts, the GP-7 series is in a class of its own. Also unlike the others, we actually have complete documentation to back up our claims. 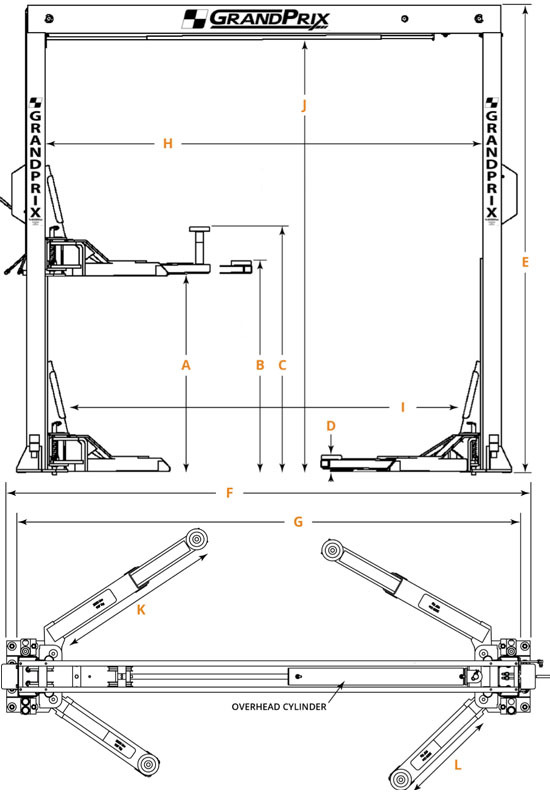 The patent-pending GrandPrix is the first and only car lift of its kind. The “secret” is really no secret at all: an overhead single cylinder combined with four redundant aircraft cables gives the truly exclusive GP-7 series lifts the advantage over all others. “Regular” two-post designs that feature columns wide enough to contain hydraulic cylinders are much larger, meaning more of your valuable floor space is consumed. We simply removed the cylinders from the columns and positioned the hydraulic muscle overhead. Not only is this ingenious design considerably space-saving, the single overhead cylinder eliminates problematic synchronization issues that are known to plague multi-cylinder two-post lift designs. As they say, the simpler the better. The massive single hydraulic cylinder combines with oversized dual-hub cable sheaves to raise cars and light trucks fast—incredibly fast—all the while maintaining rugged support. That’s because one inch of cylinder stroke ascends the lift two inches, meaning less hydraulic cylinder wear and reduced run-times for the motor and hydraulic system. Think of the GP-7 series as a time-saving (both up and down), power saving, wear-and-tear saving, and of course space-saving showpiece that is ready to tackle almost anything that rolls into your shop. Imagine gazing into a shop void of gargantuan columns… and consider how well you’ll appreciate our sleek, modern and entirely impressive design. If you’ve been hoping and praying for a commercial-grade two-post car lift that’s tailored for typical non-commercial spaces like home garages or narrow bays, then look no further. The GrandPrix never sacrifices strength or cramps your style. With the cost of residential and commercial garage space skyrocketing, elbow room is diminishing, making the need for more compact designs greater than ever. Installing a car lift that has the unique secondary benefit of providing increased and uncluttered floor space in the surrounding area helps create a more ergonomic and comfortable work environment. When it comes to saving space, innovation is key. You’re going to love the way the GrandPrix transforms your garage, and perhaps even more importantly, you’ll feel that your vision for the perfect car lift has finally become reality. Below identifies the redundancy built into every GrandPrix lift. (As if a safety factor on the lifting cables exceeding 800% is not respectable enough). We feature spring-loaded cable break safeties that act as slack-cable locks in case of backup cable failure. *Only the GP-7 model is currently certified. *CE Approved and Certified. Meets or exceeds the standards prescribed by European Standard EN 1493. Not all BendPak lift models meet the standards as prescribed by ANSI/ALI ALCTV (Current Edition) or ANSI/UL 201. Consult www.autolift.org for a complete list. Click the button below to add the BendPak GrandPrix™ GP-7LC Bi-metric™ Narrow Bays & Low Ceilings 2 Post Lift to your wish list.